Bright Time Buddies turn any dark space into a magical place. Bright Time Buddies provides the right amount of soothing colorful light, making night time reading more fun The colors are a soft glow so kids can fall asleep with comforting light, rotating between blue, purple, teal, and green. 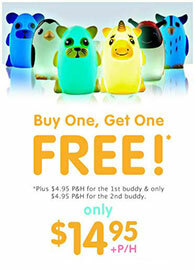 Bright Time Buddies have a soft body for squeezable fun, so your child can take them anywhere they go.